Epaminondas (ca. 418-362 B.C.) - After Sparta defeated Athens in the Peloponnesian War, it would be natural to assume that Sparta was free to dictate events in Greece. It was not. For one thing, even in victory, the war still took a toll on Sparta. For another, Greek city-states had a tendency of aligning themselves against the ruling power (the classic "balance of power" strategy). It happened to Athens before the war, and it happened to Sparta after. Still, in the immediate aftermath, Sparta was easily the most powerful city-state and it was not afraid to show it. It wasn't long before Corinth and Thebes, who had both been allied with Sparta during the Peloponnesian War, turned against it. This was due mainly to Sparta's practice of unilaterally imposing oligarchies on other cities. In 395 B.C., an alliance between Corinth, Thebes, Athens and Argos tried to end Sparta's monopoly on power. It failed. However, in 382, Sparta installed an oligarchy in Thebes itself. This move insured permanent enmity between the two city-states and brought a new statesman to the forefront of Theban affairs. His name was Epaminondas and he is the most important political figure in Greece between the end of the Peloponnesian War and the Macedonian conquest. In 379, Thebans overthrew their Spartan rulers and Epaminondas led the citizen uprising. Sparta planned to punish Thebes by sending an army to subdue the city. However, for various reasons, including the fact that Sparta privately was unsure of outright victory, it would be eight years before the armies would meet. They finally did, in 371, at Leuctra. Epaminondas lead the Theban troops and won a smashing victory. 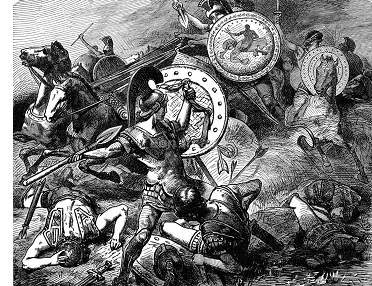 The battle sent shock waves throughout the Greek world. The Spartan war machine, which had been considered virtually invincible for three centuries, had been debased. Epaminondas' victory began a decade of Theban hegemony that would end in 362 at the Battle of Mantinea. Again the two sides would meet and again Sparta would be defeated. But, Epaminondas would also lose his life at Mantinea, and both sides were severely weakened. This opened the door for Philip II of Macedon to conquer all of Greece beginning in 349 B.C..